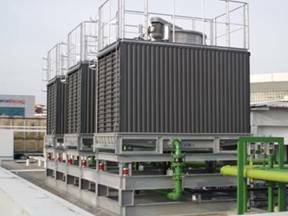 Active Solutions – Personalized Ventilation, Displacement Cooling etc. 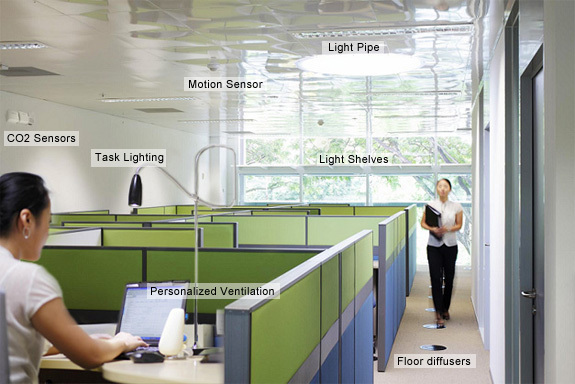 Active Controls – Motion sensors, CO2 sensors etc. Patented by the National University of Singapore, the Single Coil Twin Fan system is an innovative air-conditioning and air distribution system that improves occupants’ thermal comfort and indoor air quality in tropical buildings whilst significantly saving energy. 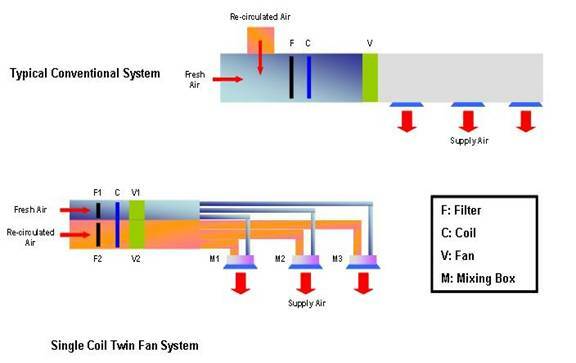 Energy is conserved because the fresh air fan and the re-circulated cooling air fan are controlled independently to optimize their respective airflow requirements based on the individual, localized demand for ventilation or cooling. This differs from conventional systems where the fresh air and re-circulated air are controlled together. The use of the Single Coil Twin Fan can possibly lead to improved air quality, thermal comfort and humidity control. Air-conditioning load can be reduced as ambient environment can be kept at slightly warmer condition (e.g. 26 degree C). Dedicated individual cool fresh air supply duct with adjustable air volume is installed at each desk. This approach improves the air quality in the immediate breathing zone of the occupants. As a result, the surrounding air conditioning can be set at a lower air supply rate without compromising occupant comfort, health and productivity, as this is already directly controlled via the personalized ventilation system. Air is supplied at low velocity to the occupied zone, usually near the floor (pictured left). This new air is slightly cooler than the ambient air and thus has a strong tendency to fall and spread out over the floor uniformly due to gravity, without mixing with the warmer air above. As air in the occupied zone becomes heated and polluted by occupants etc., it rises upwards due to natural convection. This continuous process leads to an upward displacement of air in the room, akin to filling a bathtub with water. Air is then extracted from the room at ceiling level. This system can be enhanced if it is coupled with personalized ventilation system. Electronic ballasts used in T5 lamps operate in the high frequency range (40 – 100 kHz). This increases the luminous flux of the lamp by approximately 26% (In other words, reduces 26% in wattage). The energy consumption of fluorescent lamps decreases from 43W for T8 lamps including electromagnetic ballast, to 22W for T5 lamps including electronic ballast without any compromise in the luminance. The technology is still evolving and the direction is toward the application of advanced technologies such as Light Emitting Diode (LED) systems. These are used in areas where the air-conditioning system is served by the Single Coil Twin Fan AHUs and Single Coil Twin Fan FCUs. The Building Management System controls, monitors and manages all the equipment installed in the building. ZEB will be monitored in real time through the installation of different types of sensors throughout the building. Data collected in the centralized database will be used to produce audit reports as well as other knowledge that enhances the understanding of the building. It will also be used as feedback to the actively control the system. This minimizes the energy consumption by effectively reducing wastage through the optimizing all energy usage. It will show whether ZEB has achieved “zero energy” within the first few months of occupancy. Examples of Building Management System applications could be the refrigeration plan control, air-conditioning fresh air flow rate control, lighting management and building energy monitoring. 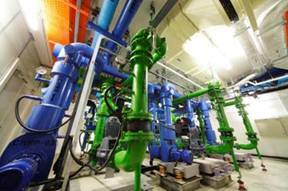 Building Management Systems are prerequisite components of advance low/zero energy buildings or intelligent buildings.